Not many debut actors gets the chance to be promoted on such huge scale. But newcomers Athiya Shetty & Sooraj Pancholi are very luck in this because they're being promoted by Bollywood's superstar Salman Khan. Even a romantic number was also sung by Bhaijaan to attract the audience. This year we got to see all time blockbusters like Baahubali, Bajrangi Bhaijaan, Tanu weds Manu Returns & ABCD 2, but all movies has star cast or some contents which could attract the audience. Hero which is a remake of Subhash Ghai's 1983 film of same name. It's a romantic action film but has new faces so, it's very important that lead stars should get introduced to audience properly. It's superstar Salman Khan's production so, Salman has very big plans to promote the film. "Yes, we have to strategize differently," confirms a source attached to the film, "Whatever genre does a film belong to, you have to come up with new ideas. You can't have a routine kind of marketing." 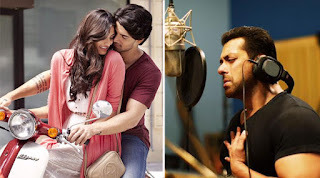 "Since Salman is there and Hero is his production, he will obviously play a very important role in the whole plan. Meanwhile, Eros is making sure to present and distribute the film in a right way. They are going to pitch Hero well across the globe," a trade source adds. Hero is scheduled to release by September 25th, 2015.